In October, the USDAC launched #HonorNativeLand, a campaign and call to action to spread the practice of acknowledging the original Native inhabitants of the land at the opening of all public gatherings. Acknowledgment by itself is a small gesture. It becomes meaningful when coupled with authentic relationship and informed action. 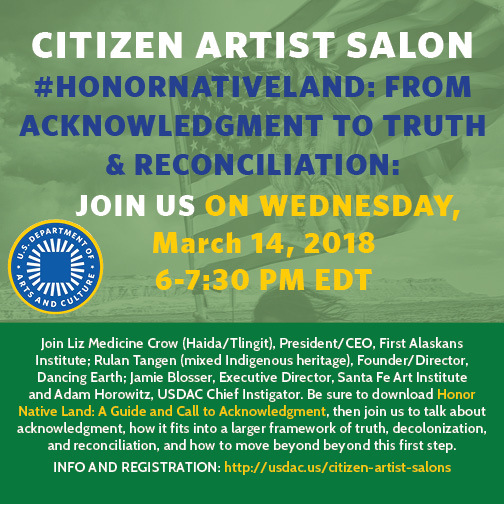 In this Salon, we’ll be joined by culture-bearers, leaders, and activists to discuss the practice of acknowledgment, how it fits into a larger framework of truth, decolonization, and reconciliation, and how to move beyond beyond acknowledgment in our organizations and communities.